I think I most often see this dish prepared with chicken. Which is a bummer for me because this sauce has an amazing flavor, but I don’t often eat chicken. So, of course, I’m learning to make it at home. Problem solved. This is in no way a traditional tikka masala, but rather just how I like it. I hope you like it too. It’s got tons of spice, tempeh to make it filling, and crunchy cashews on top. The cashews are probably the most nontraditional thing about how I make this, or at least a contender. But I just love adding nuts to tons of different dishes. They add crunch, flavor, and a little bit more protein. Vegetarian Tikka Masala, serves 2-3. While the rice cooks, get the sauce and tempeh ready. In a large saucepan, heat the butter over medium heat. Add the onions and cook for 1 minute. Then add the garlic and ginger, and cook for an additional minute. Now toss in the tomato paste, water, cream, and all the spices. Pro tip: I put all the spices in a small bowl before I begin cooking since it takes a little bit to measure all that out. Add in the cubed tempeh and cook until everything is hot. If your sauce seems too thick, add a little more water or cream. Taste and season with salt if needed. Begin by cooking your rice according the the package directions. You could also choose to skip the rice and serve this with naan instead. Or both. Once you're ready to serve, sprinkle on the chopped cashews and cilantro and a lime wedge. This looks amazing! Cashew nuts and curry are amazing together!! Um, YUM! Just had some vindaloo at an Indian restaurant in KC last week and am dying to try Tikka Masala! Great recipe, friend! It’s so cool you’re posting this, because my BF were just having takeout chicken tikka masala last night and I said how nice it would be if we could get it vegetarian. No joke. That spice list is a bit intimidating though. my fave indian dish! i’ll have to try this!! I’ve wanted to make this for a while but was waaaay too intimidated. this recipe simplifies things in a way I think I could handle though! I think I’ll try making this with paneer, yum! I second the paneer tikka! SO good. Most Indian places offer this with chicken because it is a very Americanized dish. You can always order a vegetarian option, I usually ask for paneer or chickpeas and eggplant. Potato and spinach is good too. But basically anything with a spicy thick tikka sauce is good! as an indian, what I think you are looking for is “shahi paneer”. Its basically the vegetarian version of butter chicken and has the same base gravy used in tikka masala. You can pick up a multitude of these spices from any indian grocery store (which has a LOT of different spices to experiment with). My newest obsession is Indian flavours! Since I had banana in coconut curry, I’m obsessed. Next step? Tikka Masala! Don’t let the spice list intimidate you. It might be long, but there aren’t a ton of complicate things you need to do with it. Just mix in a bowl and dump it all in at the right time. We love to make tikka masala @ home! If you don’t want/ don’t have cream, coconut milk works really well- also helps to make the dish vegan if needed. this looks outstanding! i love a warm meal… specially after a LONG day!!! i’ll keep this in my list of recipes to try! thanks! Agree. I sometimes put chickpeas in, instead of tempeh. They sort of give it a little more crunch than tempeh. Both are good. I’ll have to see if I can find paneer around here. Sounds good! Thank you so much! I will for sure be looking into your suggestion. Great suggestion! I was wondering if coconut milk would work well in this, so thanks for chiming in. I’ll be trying that next time as I love coconut milk in curry dishes. THis looks so good! I’m so excited to try this, especially because I am getting my own kitchen soon! I love that you are doing more vegetarian meals! My little brother lives with me and he has been a vegetarian for 12 years.. This helps because I’m sure he is tired of the same old thing, and I can just add meat to a plate or two for my boyfriend or friends over! Thank you! This is so going to be Sunday’s dinner! I have always been in love with Indian food and this looks so yummy! It’s really so easy to put different proteins into the sauce. Have you tried adding chickpeas? So so good! Once again I am looking at food in the middle of the night :)) Love the recipe by the way. You show me anything veg and I am sold! I’m a Kauma fan myself, but this does look delicious..and the ingredients all look so healthy! Looks delicious my tummy rumbled! YUM! Your photos are always so mouthwatering! This looks SO DELISH. So good. Also, maybe it’s just me, but I can tell the difference with your new camera you bought! Your photos were always gorgeous but these photos of this tikka masala just seem to POP! Great job! Just made this tonight and I loved it! I did make it with chicken prepared the way epicurious suggested. My husband thought it was a bit heavy on the tomato paste so I might just do a half cup next time. But here will definitely be a next time and I loved your addition of chopped cashews! Since most Indian food is available in a vegetarian version ( in fact my Indian friend says you almost never would see meat served in India, it’s super rare because of Hinduism but also just economics), I often see this with paneer cheese in place of meat, which seems to not be too hard to find around here and is super yum. If you’ve never had it, it has a similar consistency to firm tofu and you can pan fry it. I love Tikka Masala, but am a vegetarian so this is PERFECT for me! I might swap the tempeh for tofu and then I’ll be sorted! I am making this next week! Amazing looking recipes, as per usual. I’ll let you know how it goes! I will definitely have to try this! For some reason I’ve always had a hard time cooking with tempeh, and this looks like a great dish to broaden my abilities! Thanks for sharing! It looks sooo delicious! I probably have to try <3 But in a slightly different way, since i'm vegan! This looks great! I’d love to see more Indian dishes on ABM – I didn’t realize they weren’t that difficult! This looks good, I’ve been trying to find a curry recipe that would go well with the cauliflower rice I made…this may just work. P.s. I think the cashews are pretty traditional, actually. And the perfect addition!! In Indian cooking they get that mad amazing flavor by simmering the spice mix with the ghee, before adding the other ingredients. Try it! We eat jasmine rice by the pound, but I’ve never seen brown! I don’t know why I never thought to use tempeh in Indian dishes!! Such a great use for it. I love Indian food, and I’m sure this will be a new go-to veg dish in my household! OMG! This looks sooooo good! Nom! What a great veggie version! I’ll try it. I have been following your blog from India since 4 years now. Love that you are experimenting with Indian dishes as well..You can look up for recipes from Sanjeev Kapoor or Tarla Dalal. Tarla Dalal is like the Julia Child of the U.S. Have you tried paan? Im sure you’ll love it! I’m Indian and I say go for it. Most Indians are vegetarian anyways, and there are a ton of vegetarian options in India. This is a great take on a “traditional” dish. I love seeing variations of this. Yay, “serves 2” my favourite words! I often drool over recipes, scroll down and then find it serves 6 and is tricky to adapt. This is going to be made soo sooooooonnnn! Looking forward to try it! Looks delicious!!. Do you think it is possible to use tofu instead of tempeh? YUM! 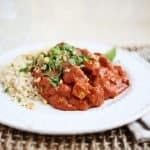 I LOVE chicken tikka masala, I can’t wait to try this vegetarian version. I made this recipe last night. My husband and I both loved it! I really appreciate all of the vegetarian recipes you share and your experimentation with new proteins. I always find amazing inspiration on your site! Thanks!! Thanks for the inspiration, Emma! I’m slowly moving away from eating meat altogether, and this recipe is a great example on how delicious vegetarian/vegan dishes really can be. I followed your recipe, but swapped butter and cream for coconut oil and coconut milk – maybe these changes made the sauce a bit unbalanced(? ), since I found it to be way too bitter for my taste. Some brown sugar and more coconut milk to the rescue…. and voilà, perfection!